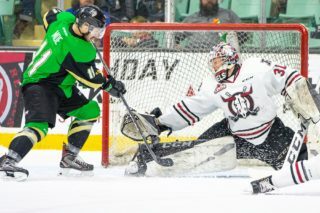 He’s new to the Red Deer Rebels, but it’s not like he has no knowledge of the organization. 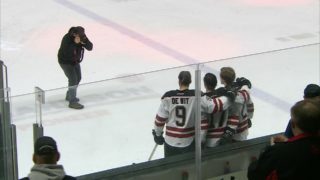 “Coming to work for the Red Deer Rebels . . . it’s a premier organization in major junior (hockey),” newly hired assistant coach Brad Flynn said Saturday. “I grew up on the east coast and we heard all about Red Deer. Their reputation precedes them from coast to coast. Then when you get here . . . it’s really blown me away. As Flynn noted, his father Dan was a long-time Quebec Major League head coach and was also an assistant coach in the NHL for two years. Dan Flynn took on a new challenge last year when he joined the Portland Winter Hawks as an assistant bench boss to Mike Johnston. Now his son is ready to move behind a Western Hockey League bench for the first time. The younger Flynn, a native of New Glasgow, N.S., played junior A hockey in the Maritimes, then played at the University of Southern Maine for one year and at Brock University for three seasons. He then suited up with Huntsville of the Southern Pro League for one winter before becoming an assistant coach/assistant GM with the Swan Valley Stampeders of the junior A Manitoba League for two seasons. He hooked up with the North American (Junior A) League’s Corpus Christi Ice Rays as an assistant coach for the 2014-15 season, joined the Acadie-Bathurst Titan of the Quebec Major League as an assistant the following season, then returned to the Ice Rays as GM/head coach, a dual position he held each of the last two years. Flynn insisted that while his father was an influence, he never nudged him into coaching. “He never pushed me towards it. Actually he pushed me towards university and I got a degree because he pushed me that way,” said Flynn. 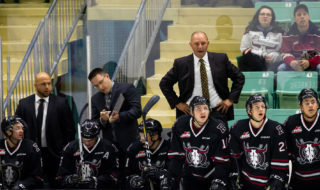 The 33-year-old and fellow Rebels assistant coach Ryan Colville, who was also hired in early May, ran the benches during the first two days of the team’s spring prospects camp at the Penhold Regional Multiplex. Flynn was impressed with the talent and also the off-ice behaviour displayed by the 26 players born in 2002 and ’03 participating in the three-day event. “I came in with a completely open mind. Out east we’ve always drafted 16-year-olds, so this is a new challenge for me with a 15-year-old group,” said Flynn. “But I’ve been really impressed with the speed and skill level … and just the maturity of these young men. They’re really polite, well mannered. You can tell it’s part of the culture here to draft and list guys like that because they come in here and look like they’re young professionals already. 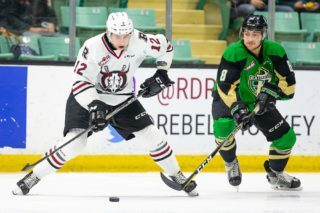 Rebels GM/head coach Brent Sutter is convinced both Flynn and Colville, with their knowledge of today’s game, will bring a fresh set of mentoring skills to the team. “You can use all the buzz words you want but at the end of the day it still comes down to winning the little battles and doing everything the right way,” said Flynn. 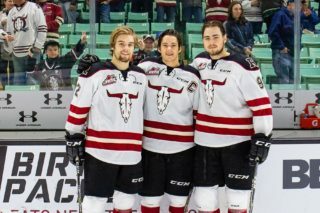 “I think that’s the philosophy here in Red Deer and I think I can add to that while bringing maybe a couple of different ideas. Flynn insisted that he’s not looking at his new position as a stepping stone to a head coaching gig at the major junior level. “At the end of the day I don’t really look at it that way,” he said. “I came from being a head coach and I really enjoyed it, but when you get the opportunity to work for Mr. Sutter you never turn that down. The Rebels prospects camp concludes Sunday with on-ice sessions from 9 to 11 a.m.
Defence — (d) Chase Leslie, Camrose, 2002; (l) Garrett Valk, North Vancouver, ’02; (d) Blake Gustafson, Ardrossan, ’02; (d) Kyle Masters, Edmonton, ’03; (d) Anthony Williams, Trail, B.C., ’02. Forwards — (d) Dylan Fader, Vancouver, ’03; (d) Jordan Borysiuk, Manville, ’02; (l) Keaton Sorensen, Red Deer. ’02; (d) Nickolas de Beurs, Cochrane, ’02; (d) Chase Bertholet, The Pas, Man., ’03; (l) Jamie Valentino, Thompson, Man. ’02; (d) Jayden Grubbe, Calgary, ’03 (injured). Defence — (d) Jace Isley, Grande Prairie, ’02; (d) Jeremy Hancock, Melfort, Sask., ’03; (d) Trey Patterson, Calgary, ’03; (l) Mason Ward, Lloydminster, ’02; (l) Skyler Cameron, Nanaimo, B.C., ’02; (l) Jordan Edwards, Saskatoon, ’02. Forwards — (l) Riley Goertzen, Homewood, Man., ’02; (d) Ethan Rowland, Calgary, ’02; (d) Jaxsen Wiebe, Moose Jaw, Sask., ’02; (d) Hunter Brown, Fort St. John, B.C., ’03; (d) Josh Medernach, Lloydminster, ’03; (l) Graham Gamache, Edmonton, ’02. Goaltenders — (l) Carter Serhyenko, Saskatoon, ’02; (d) Dylan Lacroix, Calgary, ’03; Zane Winter, Carlyle, Sask, ’03.